I’ve performed in the Poetry&Words tent twice. In 2011 I did a couple of solo sets there, the previous year I did it as part of Aisle16. I remember that set being really fun; drunk and ramshackle but all the better for it – exactly what festival performances should be. It’s actually hard to grasp Glastonbury without going. Certainly watching it on TV doesn’t do it justice. You need to climb to the top of the hill by the stone circle, where the flags are, and look down at its vastness. It’s always a special moment standing at the top of that hill. Even more so in 2013 after having a year off. My favourite poet is Ross Sutherland. I love his books, I love watching him perform. He has more ideas in one poem than most poets do in an entire collection. He’s one of the first poets I ever saw perform and it’s still as much of a treat every time it happens now. 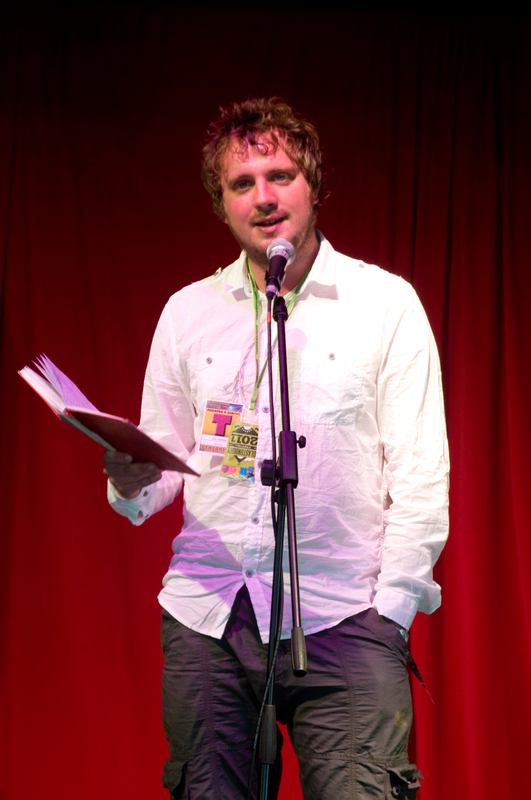 Another poet I really love at the moment is Rob Auton. He runs Bang Said The Gun, the most enjoyable spoken word night in London, and his material is consistently funny, interesting, unique. I love the way he uses a controlled surreal humour; it’s always rooted to the everyday but goes on all sorts of adventures, storytelling and making little worlds out of nothing. His 2012 Edinburgh show was really special too. The Yellow Show. It’s a show about yellow things. He makes me laugh for the same reasons Tim Key, Adam Buxton and Simon Munnery do. I’ve just finished my new book. Don’t Need The Sunshine. It’s published by The AA next year. It’s about British seaside towns. I’ve also recently finished a poetry book, my first full collection, called Most People Aren’t That Happy, Anyway, published by Nasty Little Press. Other than that I’m working on some ideas for Radio 4, another Edinburgh show, and I present a radio show every week with Tim Clare on Future Radio. That’s always the highlight of my week. I’d probably try and incorporate Grange Hill somehow. It’s you I feel sorry for. so ordered a finger buffet for fifty. me and you, your mum and dad. this was the kind of thing I had in mind. as the waiter offered us yet more crabsticks. We both knew you’d have triple-checked. “Not even Graham,” you said. and blew out the candles on the cake. thirty red and thirty white. the receipt was in your handbag that had been snatched that morning. who still had her coat on. “Maybe there’s something good on the telly,” he said. juggling satsumas as we looked out the window. It wasn’t a special birthday. I was 29, a prime number. and showed everyone the massive bruise on my knob. I just thought more people would be interested.